David Haye will face unknown Kosovan Arnold Gjergjaj in the second fight of his comeback on 21 May at the O2 Arena. 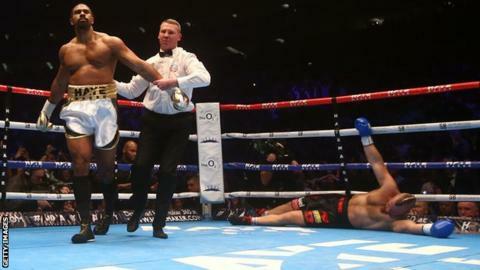 Britain's Haye, 35, beat Australia's Mark de Mori with a first-round stoppage in January after a three-and-a-half-year absence from the ring. "I said from the start I want to fight regularly and get some momentum back in my career," said Haye. He also said 10% of ticket money will be donated to boxer Nick Blackwell, who is currently in an induced coma. Blackwell was found to have a small bleed on the brain after being stopped in Saturday's British middlewight title defence against Chris Eubank Jr.
Haye's opponent Gjergjaj has won all 29 of his contests but only one of those have been staged outside Switzerland, where the 31-year-old heavyweight lives.